OMG this Sweet and Sour Cauliflower Stir Fry is so good! I am a big fan of sweet and sour sauce. Sadly, most store bought brands are loaded with sugar and other additives. So I had to make my own and boy did it come out good! Actually, I can’t take total credit for this one. I came up with the idea for a sweet and sour cauliflower stir fry, but my husband Marcus created the dish. Some other creations of his are my Peanut Noodle Stir Fry and my Sweet Potato Chili. He is so much better at the savory recipes. I served this over brown rice, but it would be equally as good over quinoa. 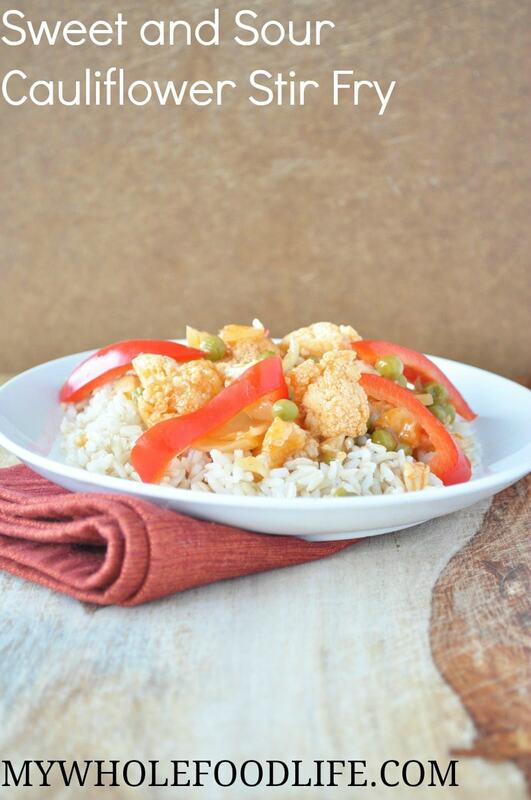 This Sweet and Sour Cauliflower stir fry is vegan and gluten free. You could probably serve it over cauliflower rice for a grain free option. I kept the veggies and the rice in separate containers in the fridge so I could add the amount of rice I wanted. I ate 2 servings of the veggies and only a small portion of the rice. I can see the sauce working in a lot of other recipes too! In a bowl , mix all the sauce ingredients together. In a large saute pan , with a little oil, add the cauliflower florets, onion, peas and sweet and sour sauce. Cook half covered on medium heat for about 15-20 minutes. Add the garlic and salt and cook uncovered a couple more minutes. Serve over the rice or quinoa. I also added some raw bell peppers to mine right before I ate it. This should last a week in the fridge. Enjoy!! I love the sound of that pineapple sauce! Can you think of anything that might replace the vinegar in the sauce? I have a friend who can't eat that and I would like to pass this along. Thanks! This sounds so yum! Can she have apple cider vinegar? It may work. Thanks for the tip! I didn't even think about that, but I think that is a good idea. Is there gluten in regular vinegar? I wasn't aware of that. You may be able to use rice vinegar in this. I have been meaning to write and thank you for your amazing, delicious vegan recipes for several months now! It is my new year's resolution to control as much of my health and well-being as possible, while dealing with a 3-year long rare neuralgia that causes horrible, constant pain. I've gone through a failed brain surgery, two other failed surgeries and more nerve blocks, Botox, medications and other procedures than I can count. There are not many days when I feel good, and don't want to crawl back into bed and wait for the pain to stop. This isn't viable-the disorder has no cure, only slim chances to relieve the pain slightly. I also have two amazing, patient (and hungry!) daughters, freelance work to do to pay my medical bills, and good food to make! Thank you for inspiring me, and for having so many simple, yummy dishes that even my picky eaters like! I'm hoping your book will be ordered by our nearby public library, because I love making different nut butters! I I'm working my way through all the recipes on your site--without your recipes my family would have tired of our new primarily vegetarian/sometimes vegan diet already. Thank you so much! My neighbour called and asked me if I have a sweet and sour sauce recipe for her meatballs. I gave her your link and she said ti was amazing! She had to add cornstarch (of course, meatballs) and next time will double the recipe. :) She also will add pineapple chunks too, good with meatballs I guess.